Vermin problems in the Obama White House spur National Journal reporter George E. Condon Jr. to recall Jimmy Carter’s olfactory travails at 1600 Pennsylvania Avenue. They were caused by an infestation of mice. To make matters worse, GSA and Interior refused to use traps, claiming humane groups had protested that in the past. But when mice started scampering across his office in daylight and when his meeting with the Italian prime minister was conducted amid the distinct smell of a dead mouse, Carter erupted. His fury was captured in his diary entry for Sept. 9, 1977. 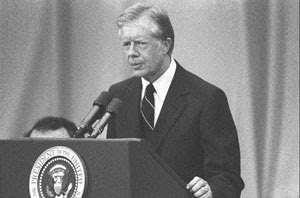 Carter that day summoned top officials from the White House, the Department of Interior and the GSA to the Oval Office to unload on them about the mice overrunning the executive offices – including the dead ones rotting away inside the walls of the Oval Office and giving his office a very unpleasant odor.